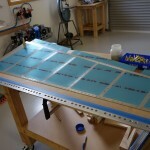 Time to take the rudder halves off the shelf and rivet them together. 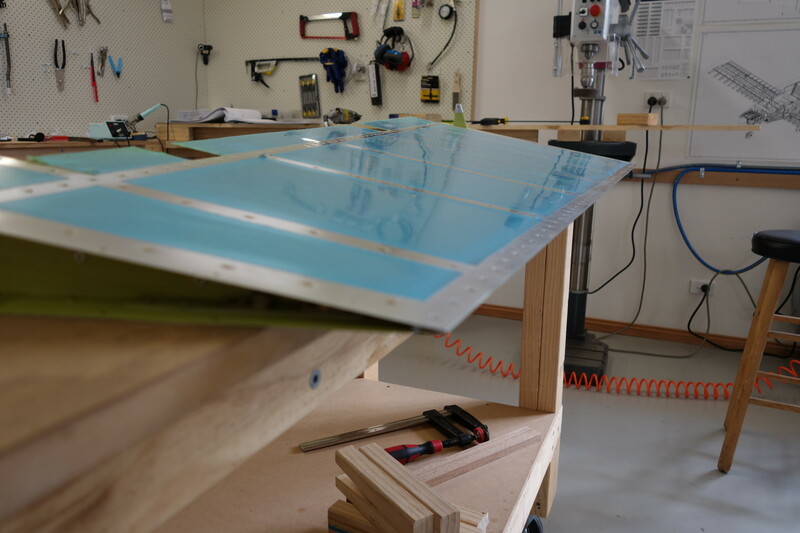 By far the hardest part of this process is riveting the rudder trailing edge without turning it into something resembling the roof of the Sydney Opera House. After researching this topic some months back, I decided to try and do this without hitting the trailing edge with a rivet gun. The method I used has been described elsewhere (and I’ve lost the link), but the description was scant so I’ll go into some detail here. 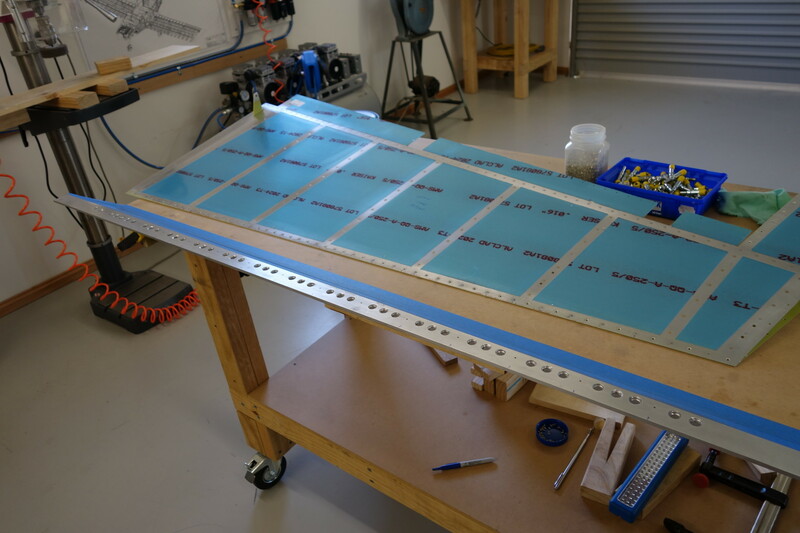 Back when I prepared the rudder components, I match drilled the trailing edge to a section of Aluminium angle, 2 metres of 50×50 angle, 5 mm thick. 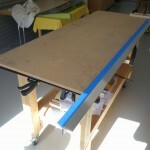 This is thick enough to be a sturdy reference straight edge, but still thin enough to be able to get cleco’s through the trailing edge and through the angle. Match drill this before dimpling the skins, so that the #40 holes will be as accurate as possible. 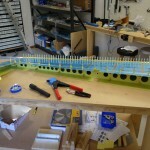 Note that the holes are not perpendicular to the surface of the angle section – they are perpendicular to the chord line of the rudder, so about 5 degrees off the perpendicular. 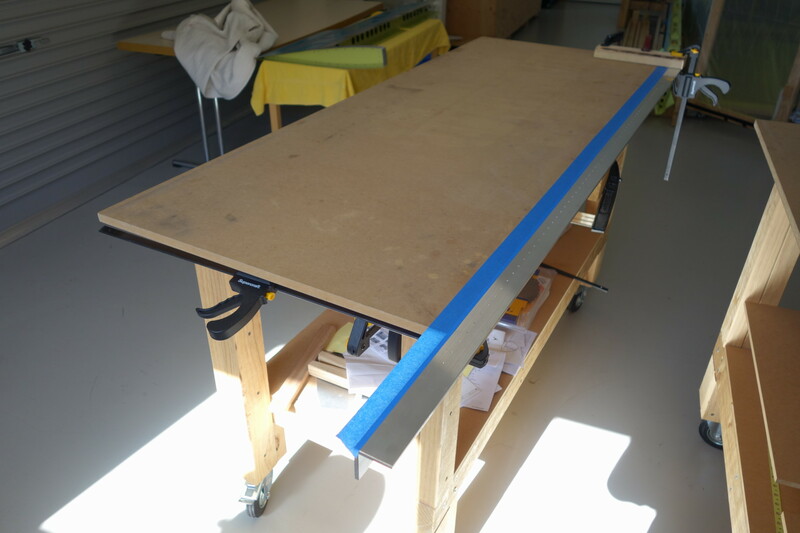 I clamped the Aluminium angle to one edge of the workbench, flush with the surface, and placed one layer of masking tape across the bench edge and the base, just to prevent any marking of the rudder skin surface. 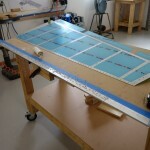 I used the 3M F9460PC double sided construction tape (available from Van’s) but the method would work just as well with Pro-seal. 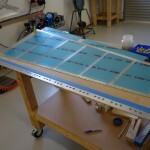 With a helper to hold the other skin up off the trailing edge wedge, as each set of ribs were riveted together, I removed the remaining paper from the double sided tape up to the next set of ribs, and also cleco’d every hole in the trailing edge up to a few short of the “next” ribs to be done, working from bottom to top of the rudder. 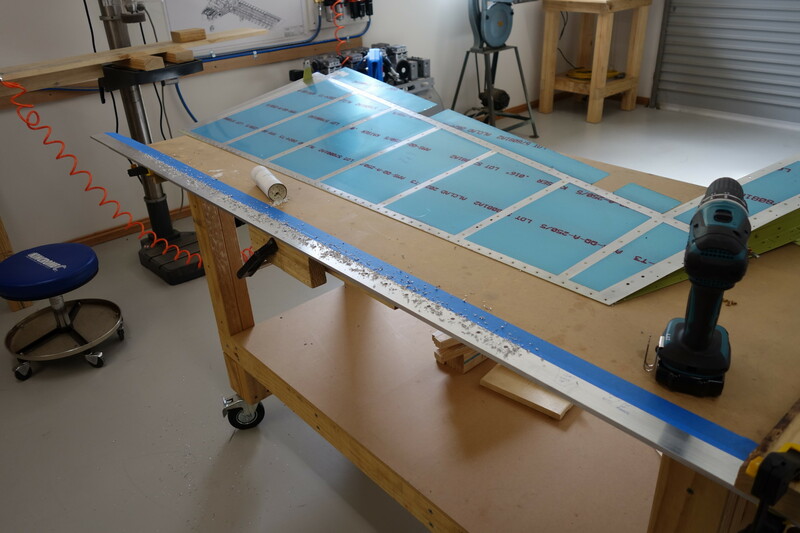 Once all ribs were riveted together, I had a continuous line of cleco’s all the way along the trailing edge, which was held down firmly against the perfectly straight Aluminium angle base. 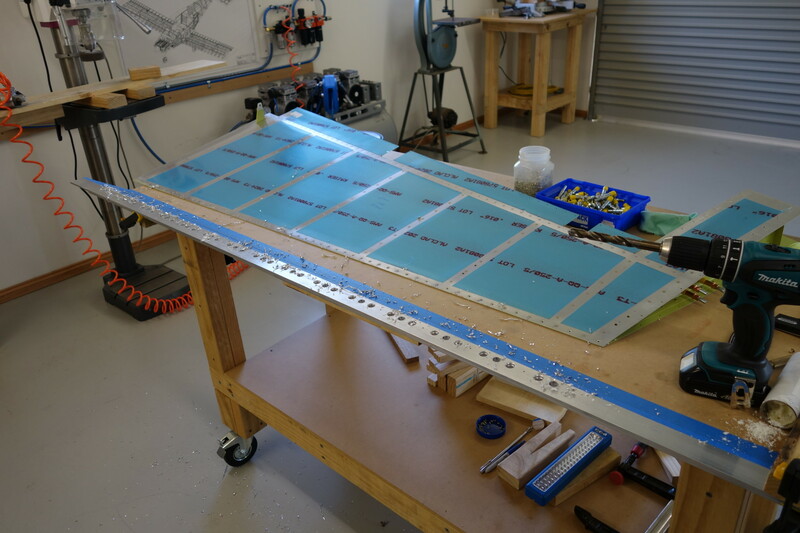 Since the rudder was held securely on the workbench at this point, I also put the front spar in place, installed all of the LP4-3 rivets from the front spar into the shear clips, and riveted the left skin (the one on top in my arrangement) to the front spar, since this was easy to do with the pneumatic squeezer. I left it this way for two days. After that time, I removed the cleco’s holding the TE to the Aluminium base, drilled every second hole in the base out (in stages) to 13mm, and then used a step drill to go just a bit larger and effectively de-burr the holes. I further deburred the holes with a scotchbrite wheel in the die grinder, then scuffed by hand and cleaned the base to ensure that no sharp edges remained. 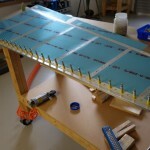 I then re-installed the rudder back onto the base, with a cleco in every second hole. 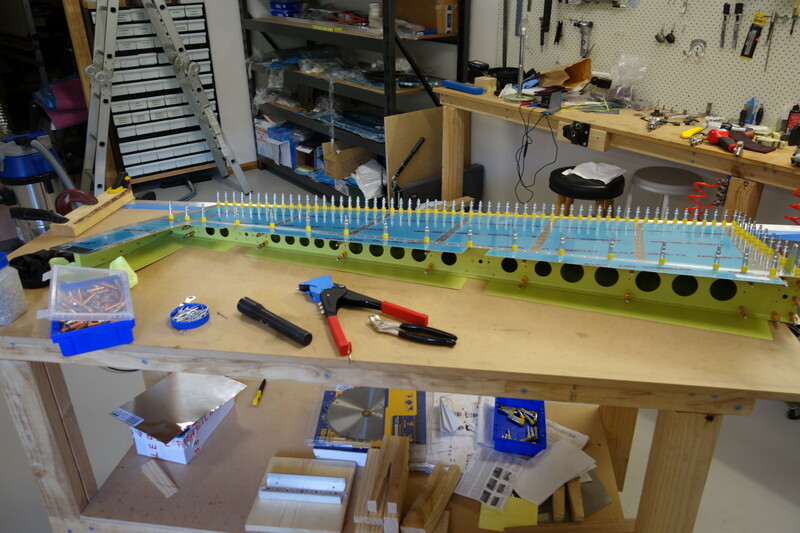 The large holes enabled me to get the rivet squeezer onto the bottom side of every second hole. 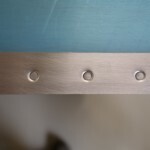 I (very carefully) used flush die to start the rivets, just enough to set the rivets in place but not enough to touch the bottom skin (which would have been a disaster). 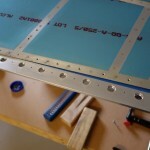 An inspection mirror is essential here, to check each rivet as it is done. 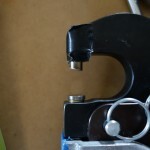 To finish the rivets, I used a modified die on the fixed side of the squeezer (see picture). 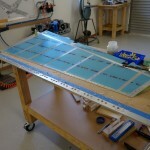 I ground a die down, so that it was 10 degrees off from flush, to match the angle of the rudder skins. 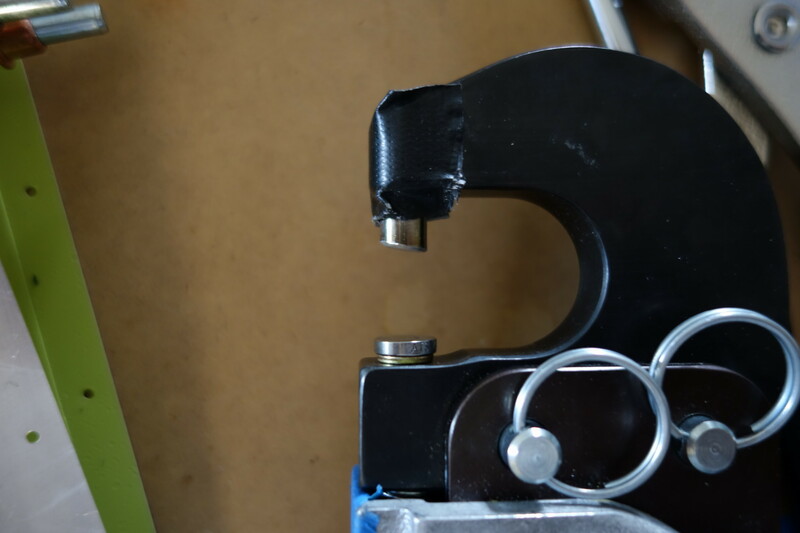 The modified die is then held in place on the fixed part of the squeezer using a bit of gorilla tape (see pictures). 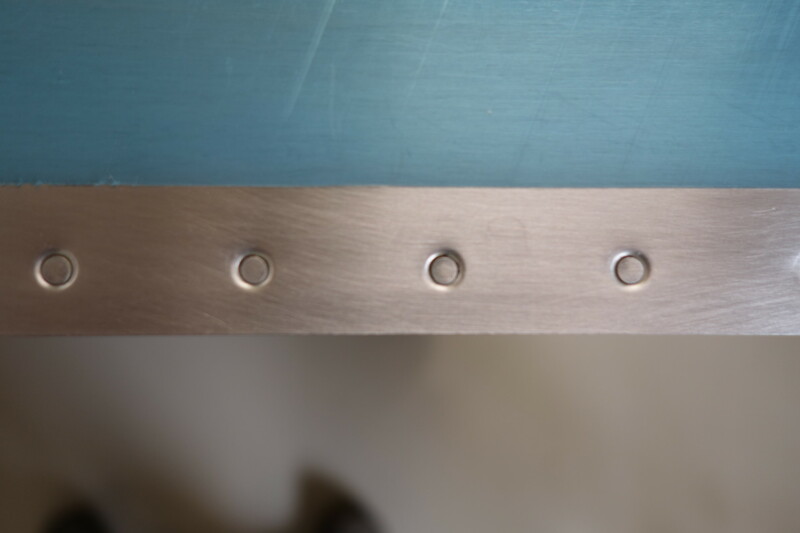 Doing the initial partial set of the rivet with flush die is what allows using a single modified die to finish the rivet – it is easier to work with a single 10 degree ground die, than two die each ground at 5 degrees. Holding the squeezer upside down, with the flush die on the top skin, I was able to fully set each rivet in the trailing edge. I backed the air pressure from the usual 90 psi down to around 60 psi for this operation. I also very carefully adjusted the squeezer gap as I did the first few rivets, checking for any witness marks around the manufactured head (from the modified die), doing some fine adjustments to the die with a file to take down any high spots. After a few adjustments, I was able to confidently squeeze the rivets to completely finish each one. The large holes in the Aluminium angle base actually helped with guidance! 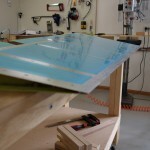 At this stage, every second hole in the trailing edge was riveted. 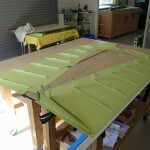 Removing all of the cleco’s, the rudder can be slid off the base. This worked so well, I decided to continue the process, and drill out every second un-drilled hole, again cleaning the base up to ensure no sharp edges remained. 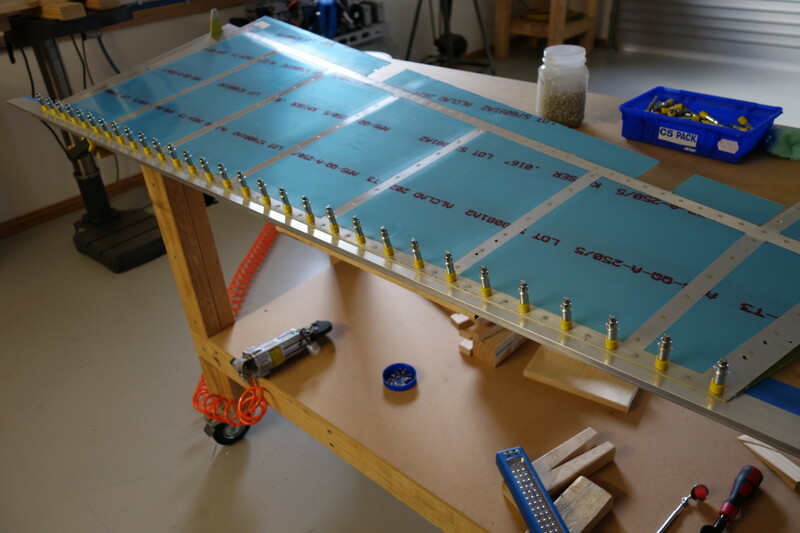 I then re-installed the rudder onto the base, with fewer cleco’s, and riveted the positions corresponding to the newly drilled holes. 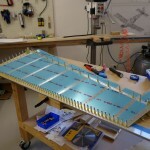 I repeated this a third time, leaving only three cleco’s holding the rudder down. After that, I riveted the three remaining holes with the trailing edge simply hanging over the edge of the base, with no guidance. The end result of all this is, the Aluminium angle has a large number of ugly holes in it, but that’s OK because it can now be discarded. 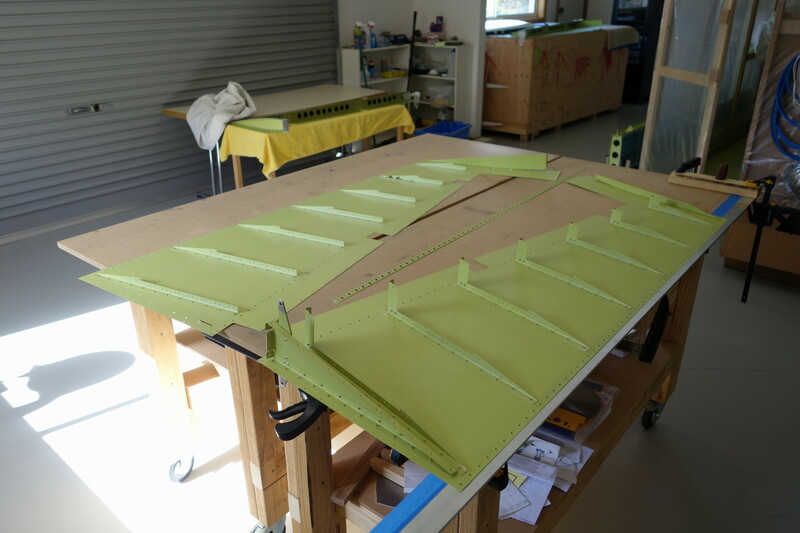 On the other hand, the rudder trailing edge is perfectly straight. 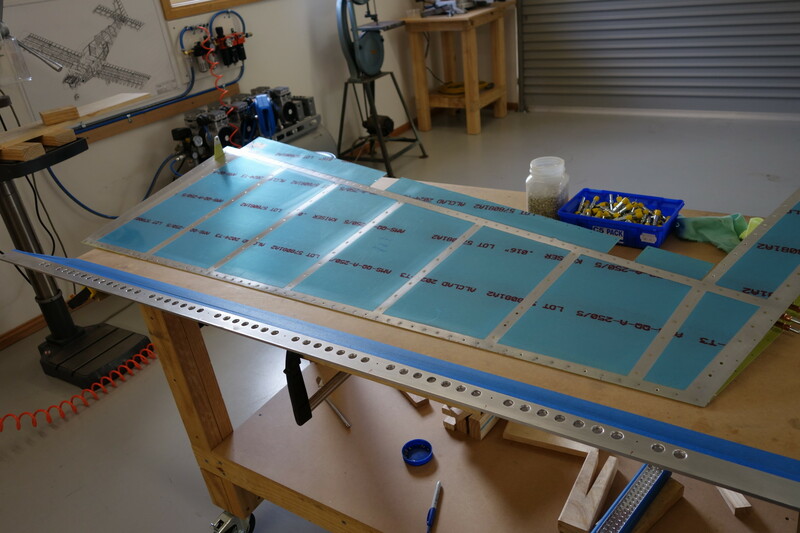 I held straight edges against the rudder trailing edge, and could not even find an air gap to try and measure how straight it is. 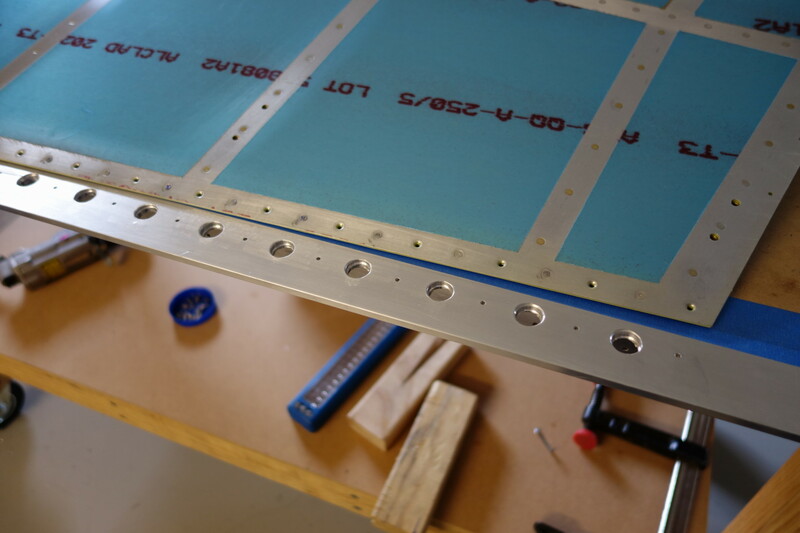 I attribute this to the fact that the method completely avoids back riveting, and all rivets are set with the squeezer while the entire trailing edge is held completely flat. 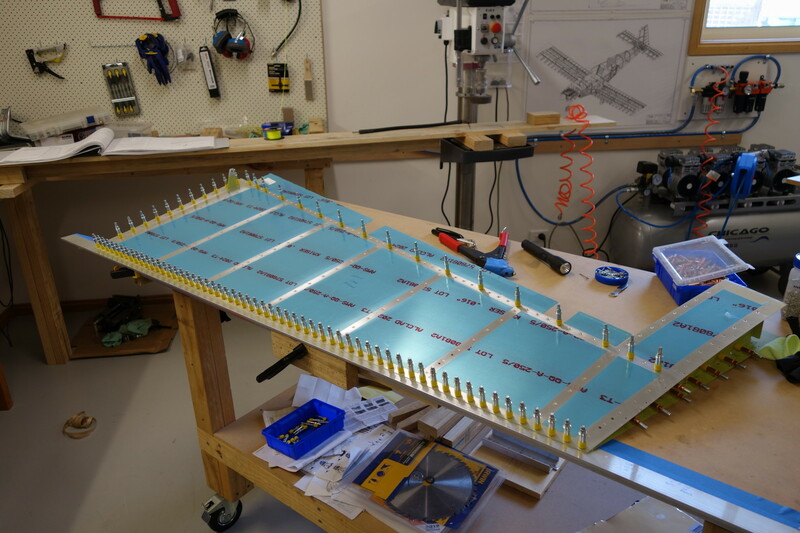 Rudder halves ready for assembly. Note trailing edge wedge.